Easter is right around the corner and decorating for the holiday is a lot of fun. 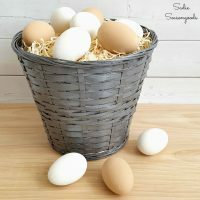 If you like a rustic look in home decorations, these Farmhouse Easter Decor items might interest you. To give your home the look of farmhouse decorating means to use items that are warm, cozy and relaxing. Farmhouse decor is full of charm and character. The style used to refer to an older style of decorating but with the popularity of TV shows such as Fixer Upper and others, farmhouse decor is now surprisingly trendy and used by savvy decorators. 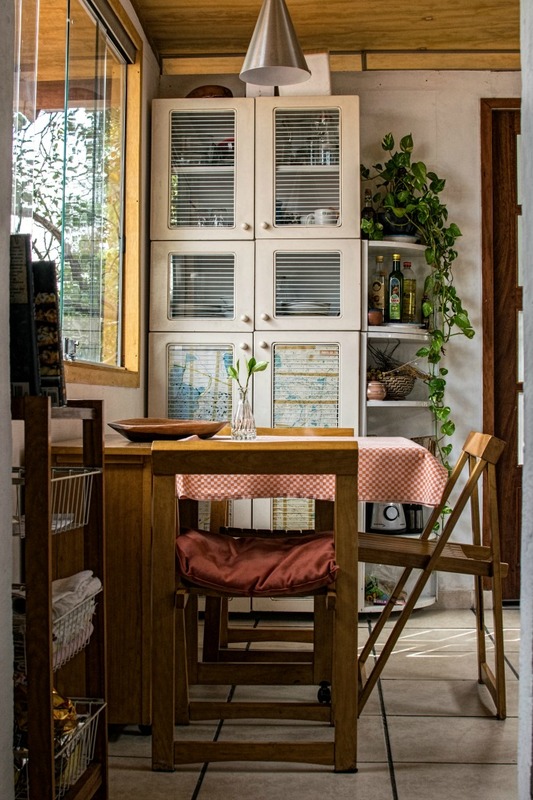 It is not enough to just have “old” furnishings in a home. To get just right look, you’ll need to incorporate some specific types of home decorating ideas. To make sure that your farmhouse decor is “in” right now, be sure to have a balance of old and new styles. If you choose only antiques, the look will be dated. Choose farmhouse colors when you paint. Colors such as light grays, whites and light blue, paired with white trim and moldings will give you the look you want. Use mosaic tiles in bathrooms and vanity areas. They have a retro look that says farmhouse to visitors. Nothing says “farmhouse” quite like a sliding barn door. It is rustic, saves space in the room and barn doors are very in right now. See how to make a sliding barn door yourself in this post. 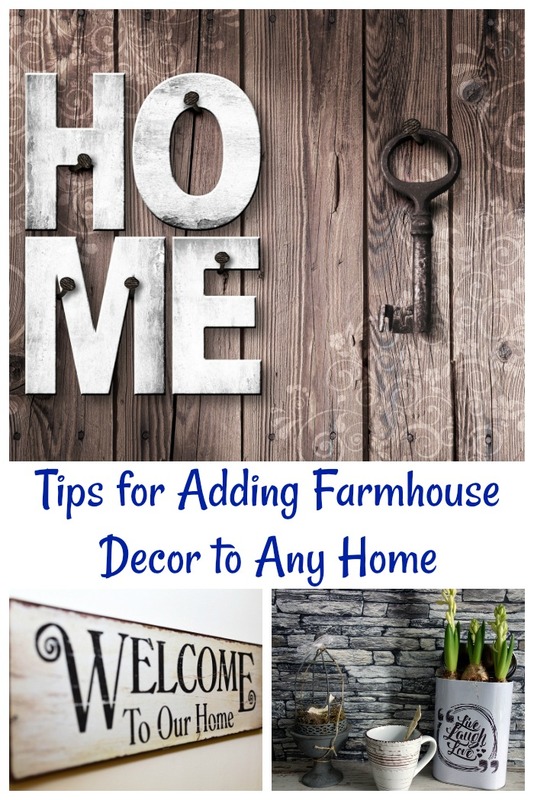 Farmhouse signs and wall art add a rustic look for very little cost. If you can’t afford to go all out with furniture, consider adding some wall pieces for a cost-effective alternative. Wicker baskets are very inexpensive and make a great source of storage while adding decor appeal at the same time. Shiplap accents on the wall or over a mantle are all the rage in Farmhouse decorations. Change out some lighting fixtures. Pendant style, rustic light fixtures give a farmhouse look over any table. Add fresh flowers, foliage stems and other greenery in clear vases to add some farm style appeal to a mantle. Open floating shelves in the bathroom and kitchen are very popular forms of shelving in Farmhouse decor. 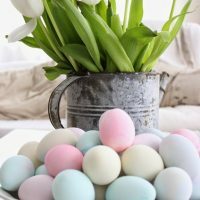 Now that you have an idea of how to add farmhouse decor, in general, let’s move on to some inspiration for the upcoming Easter holiday. The Farmhouse decor style is cozy and warm with a rustic appeal. 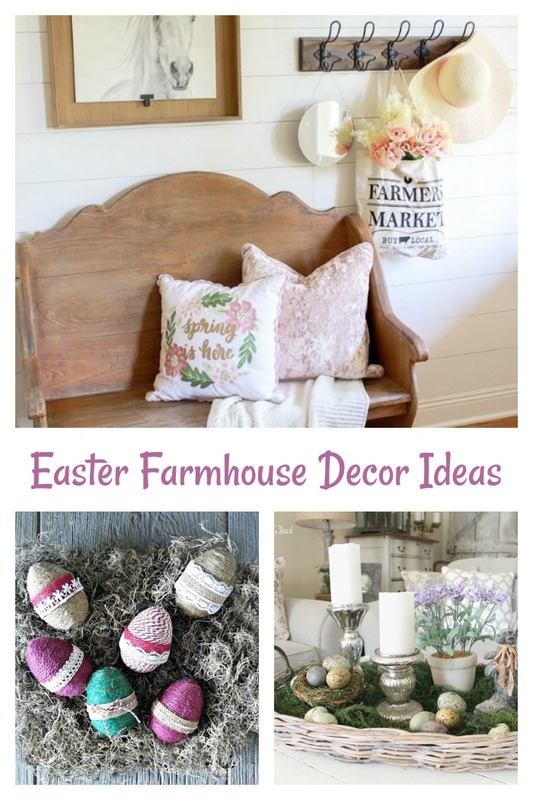 Try adding a few of these farmhouse style Easter decor ideas to dress up your home for Easter. 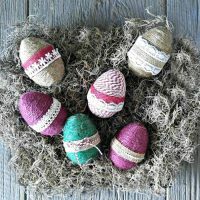 These rope wrapped eggs are rustic and colorful and will add a pretty Easter accent to any mantle or table. Turn Fiber baskets into a metal look with some creative decorating tips. This inexpensive craft is ready in no time and would look great near a fireplace. 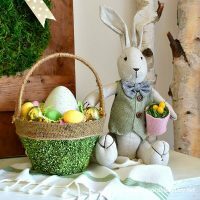 This farmhouse style Easter sideboard display features a rustic Peter Rabbit, tulips and a "Grass" bunny rabbit. 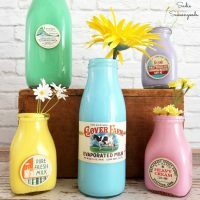 These milk bottle vases are decorated with vintage milk caps to make them even cuter. The pastel colors are perfect and the look is very Farmhouse style. 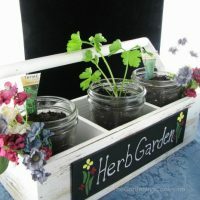 A simple Farmer's Market basket and some mason jars get a face lift for this simple Farmhouse herb garden. It comes together quickly and is useful as well as decorative. It's perfect for both Spring and Easter. 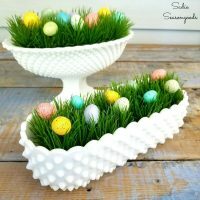 Hobnail milk glass containers get planted with wheat grass and topped with Easter eggs for this cute Easter Farmhouse decor idea. What a perfect way to have breakfast in bed on Easter morning. 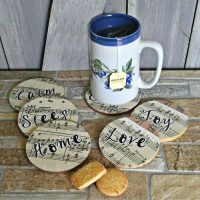 The messages on these music coasters are a wonderful reminder of home, family and love. 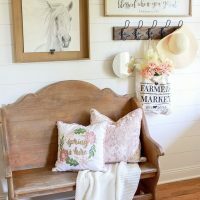 Signs and wall art are one of the easiest Farmhouse decor ideas. 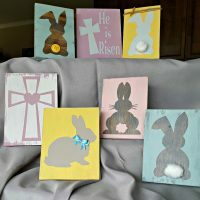 Get some ideas for Easter signs in this fun post. 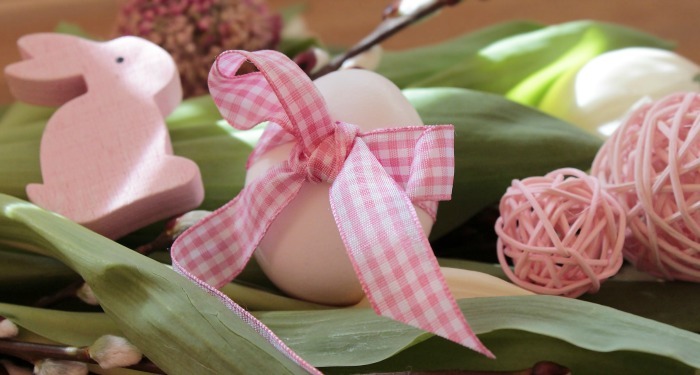 Easter vignettes are simple to put together and perfect for a one day holiday. You can even reuse parts of the vignette for other holidays. Get some tips for creating one. 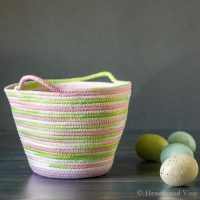 This dyed rope basket is a great beginner sewing project. One that you can easily create in an afternoon, and is perfect for your Easter decor. Drop cloth is a budget friendly and useful home material. 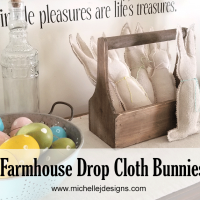 Turn it into adorable farmhouse bunnies with this project.